The first thing about the NuWave Stainless Steel Grill Pan set that jumps out at you is its red non-stick coating in its interior. 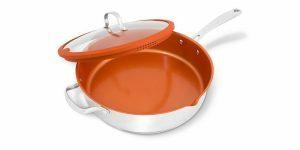 NuWave could have chosen the industry standard black or dark gray color of most non-stick surfaces but this pan’s interior comes in a red copper hue instead. This color choice is like a bright neon sign highlighting this induction cookware’s health-oriented design. After all, its Duralon (r) coating means you don’t have to add oil to grill or cook on this pan. Less grease, more health. Additionally, this NuWave cookware is completely free of traditional non-stick compounds that have given non-stick cookware a bad reputation in previous years. 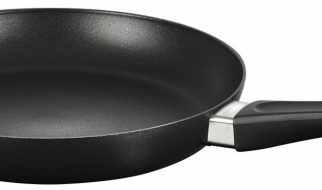 Completely, cadmium, PFOA, and PTFE-free, this pan is designed to relieve consumers’ anxieties about using non-stick surfaces. But what else does this pan set have to offer? Put simply, this NuWave induction pan set caught our attention because it delivers solid materials for optimal long-term value, versatility, ease of use and handling, easy cleanup, and durability-all at a very decent price point. 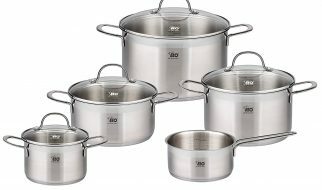 Made primarily with stainless A-grade composite, this cookware can withstand heavy long-term use. Its heating disk is able to deliver two key qualities users of induction cookware usually look for: relatively lightweight and maximum induction capability. You can rest assured that regardless of which brand of induction cooktop you use this pan on, this cookware will perform as expected. Thanks to its tough, high induction, yet light stainless steel core, you are guaranteed reliable induction-produced heat with each and every use. This is quite a big deal since many lower grade induction cookware vary in performance depending on the cooktop they are used on. Some take a bit to heat up. Others don’t even heat up at all. You won’t suffer through that uncertainty with this NuWave pan. This pan’s solid construction yet relatively light weight combine to produce maximum total use value-you are more likely to use the pan over the long haul and it can stand up to such repeated use. Designed primarily for induction cooktops, this cookware set’s stainless steel construction also does a great job conducting heat from regular flame- or electric coil-based cooktops. It can even be put in an oven with no problems at all. Whether you’re using gas, electric, induction, or an oven, this NuWave pan can withstand the high temperatures and deliver solid heat conduction. Unlike some other stainless steel cookware models produced by other brands which tend to be heavier and weight and bulky, this NuWave cookware set is very easy to lift. It is very light thanks to its thin yet durable stainless steel construction. It doesn’t take much effort at all to move this grill and pan set around. Whether you’re grilling hot dogs or meat or pan frying some chicken, you can easily move this set on your cooktop from one heating surface to another or from the cooktop to your kitchentop. Ask anyone who’s had to move a hot steaming heavy cast iron pot, ease of handling also plays a key role in maintaining kitchen safety. Your chances of getting burned by splatters or spills with this cookware are pretty minimal due to its light weight and ease of handling. Adding to these pans’ ease-of-use are their easy to grip handles which remain cool regardless of how hot the pans get. You don’t have to worry about getting burned as you move these pans from the cooktop to your table top. One of the biggest hassles of using any kind of cookware is what happens after you use them. Now comes the messy part. Food and other debris often stick to the bottoms of traditional cookware. Often, people would have to soak them in soap water for long periods of time just to soften the debris just enough so they can be gently scraped off. If you don’t wait for a long enough period of time, you might have to expend a lot of elbow grease just to clean up your cookware. Totally unnecessary and oh so frustrating. Well, you won’t have any cleanup issues with either the pan or grill pan in this NuWave set. Coated with the non-stick Duralon surface, food debris won’t stick to these pans’ surface. Even if they did, you don’t have to soak them to clean them up. Just put the pan under cool running water and gently wipe down the surface with a wet sponge. No mess. No hassle. Quick and easy. In addition to preventing debris build up or sticky messes, these pans’ Duralon coating also prevents sticky grease buildup. Many older cookware designs suffer from sticky grease build up. If they were not cleaned up properly, the grease builds up until become very unsightly. Worse, the grease builds up on the side walls and even the handle of the pan. Thanks to this cookware’s choice of metal finish as well as non-stick surface, you won’t have to worry about grease build up outside or outside the pan. You only need to wipe down with some soapy water and rinse to clean up this cookware. Talk about hassle-free. While this pan set is a bit more pricey than other induction cookware, you get a pan set that is built for the long run. Its stainless steel construction is thick enough to provide sturdy and steady reliability for many years to come. Indeed, many past buyers report that they have been using these pans for several years and they still continue to deliver solid reliable performance like the day they first used these pans. If you are looking for reliability, healthy design, ease of clean up and maintenance and long term durable value, this pan set has you covered. They are worth every penny and you can rely on them to deliver solid performance over the long haul. Click the link to order this pan set or get more direct user reviews. You won’t be disappointed that’s for sure.